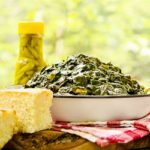 Southern Collard Greens are slow-simmered with smoked ham hocks until tender. It's a classic side dish served with hot pepper sauce and cornbread. Place ham hocks, water, salt, and pepper in a 7- or 8-quart soup pot or Dutch oven. Bring to a boil then reduce heat to a slow boil or fast simmer. Cover loosely and cook for 1 1/4 hours. Add collard greens. Bring to a simmer and cover loosely. Cook for 1 1/4 hours. Taste collards. If too bitter and still somewhat tough and firm, stir in baking soda and cook for an additional 15 minutes. Remove and discard ham hocks (or you can pull the ham from the bones and add ham back to the pot). Look for bags of shredded collard greens in the produce section. If using whole collards, rinse thoroughly a few times to remove dirt or else the finished dish will be gritty. Remove and discard the center stalk from the leaves then cut leaves into shreds (will add to prep time).